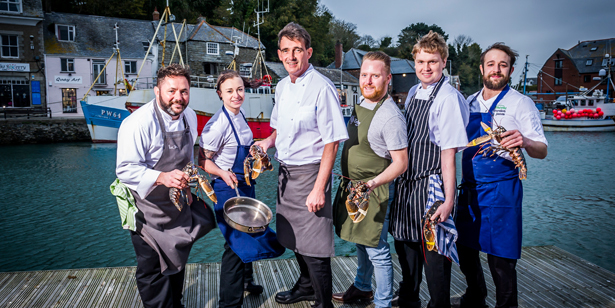 A host of chefs, suppliers, hoteliers and foodies joined us at The Seafood Restaurant on 9th November for the annual Trencherman’s Award. Guests started the evening enjoying canapés such as goats cheese, honey and beetroot Oreos, chorizo madeleines and mille-feuille prawn cocktail cones made by Dan Miles and Steven Fisher at Padstow Seafood School with cocktails and Champagne, before moving across to The Seafood Restaurant for a 5 course meal. Our head chef Stephane Delourme served the main course of Fillet of Cornish Hake with Pardina Lentils, Iberico Ham and Persillade Butter alongside other courses from Gordon Jones, The Treby Arms and Michael Caines Gidleigh Park. The evening finished with coffee and petit fours from Stuart Pate, our head pastry chef. A huge congratulations to all the winners at this year’s event, we hope you enjoyed your evening with us. Photos © Trencherman’s Awards/Guy Harrop Photography.